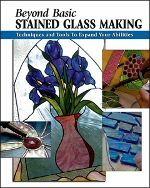 These books will get teach beginners how to do stained glass in no time or teach the seasoned crafter a new technique or project. This guide contains everything the beginner needs to know about making beautiful basic stained glass projects. Lavish color illustrations, step by step lessons, complete explanations of tools and materials, and expert techniques for cutting and polishing glass, tracing patterns, soldering, setting up a workspace, safety, and more are explained with the beginner in mind. 128 pages, 768 color photos, spiral bound. Contains 40 full-size patterns for the beginner. It is designed with both the student and instructor in mind. Included in this book are 40 colored pictures of completed projects, a variety of designs, tips and techniques to get the beginner off to a good start. This book is a second in a series of full size patterns for the beginner. Includes 20 patterns designed for working with lead came and 20 patterns for copper foil. Each pattern has been designed with a beginner in mind. Thumb nails and color pictures are included to aid the user with color selection. Build on the basic stained glass-making skills you already possess. With straightforward text and a wealth of color photos, this book will show you how to master more advanced stained glass-making techniques: making complex cuts with a table saw and repeating cuts with a jig system, making and installing hinges, foiling glass jewels and nuggets, creating and fastening mosaic pieces, using a lamp jig, applying patinas to lead and zinc, installing reinforcing wire properly. It also offers step-by-step instructions for creating a tabletop box, a large hanging lampshade, and a decorative mosaic--along with expert advice on how to improve your stained glass-making skills. 144 pgs, 750 color photos, spiral bound. A pattern resource for advanced, beginning, intermediate students and teachers. Features 40 patterns; an eclectic mix of traditional, contemporary, representational and wild designs. These patterns are designed to progress the beginner into more challenging work while maintaining strong, basic design principles. Learn the basic principles and techniques of stained glass design. Key topics: design sources, enlarging and reworking, abstract and representational design, and how to design flat as well as 3-dimensional projects. Projects: flowers, leaves, animals, birds, landscapes, architectural studies and more. 176 pages, 84 designs. A comprehensive do-it-yourself manual with step-by-step information on tools, supplies and techniques. Includes pattern making, glass cutting, fitting, soldering, and finishing for both copper foil and lead came assembly. Lamp making and other special techniques are also covered. 17 projects from Suncatchers, boxes & small windows to stained glass swag & table lampshades. 70 pgs. Learn how to use grids as backgrounds. Features florals, Victorians, birds, geometrics, and more. Great ideas for building with bevels, creating quick transoms and windows. Color representations of each finished project included. Over 40 full color designs, 32 pages. Do you have a project that needs to fit a square or rectangular frame or other existing opening? These grid sheets make it simple to find and draw the outside dimensions of your stained glass panel. It's as easy as connecting the dots! Use the center lines, grid lines, and dimension markings for reference as you draw your design. Contains 3 22"x34" sheets. 160 pages, 515 color photos. Using the wide variety of stained glass available to create one-of-a-kind tabletop boxes is explained and illustrated in an easy-to-follow format. It’s like looking over the shoulder of a master glass artist at work. 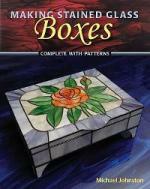 Illustrated step-by-step instruction on techniques to make a variety of beautiful and practical stained glass boxes. Photos show exactly how to assemble corners, attach hinges and lids, work with mirrored glass, create shelves and compartments, and add feet and lips. Detailed information for the beginner or more experienced glass artist. 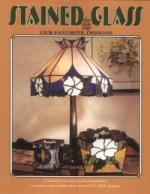 When many people think of stained glass, they think first of windows or suncatchers. 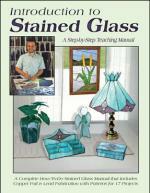 This book teaches beginning stained glass crafters how to make these very projects. 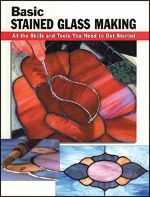 Starting with detailed instructions for the most basic steps in working with stained glass, such as cutting glass and using a soldering iron, this book guides readers through the process of building a large stained glass panel. It includes multiple designs that can be mixed and matched and built in the reader's choice of color scheme to create a personalized project. 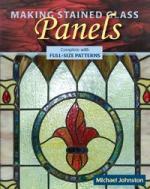 216 pages, contains 10 full-size patterns and includes a chapter on how to repair stained glass. 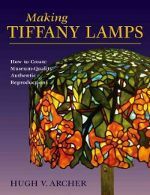 An authentic reproduction Tiffany lamp can be a handmade heirloom handed down through generations. 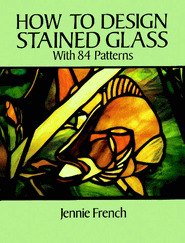 This unique how-to book describes in step-by-step detail how to create an authentic reproduction, one of the most exciting and challenging projects the stained-glass artist can tackle. Features never-before-published secrets for creating authentic patina and includes large-scale images of 30 finished lamps as well as close-ups of shade details. Color photos illustrate the entire lamp-making process from cutting the pattern and selecting glass to assembling tiles and soldering a shade. Covers a range of stained glass techniques using Tiffany copper foil from cutting glass to soldering seams. Also includes a selection of patterns you can use to make some of the objects described in the book or modify as you make your own imaginative designs. Step-by-step directions to guide in constructing mirrors, windows and panels, as well as lamps, boxes, jewelry, and fantasy items. 16 pages of patterns, over 300 photos (most in color). Presents the fundamental techniques of working with stained glass. Excellent color photographs and diagrams show materials and tools, as well as the cutting, assembling, and soldering of glass items. Includes hanging glass panels, boxes, and lamps. All have pattern diagrams and technical tips for construction. 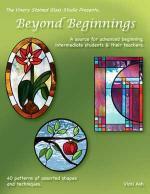 Great good book for use with classes of beginning glass crafters. 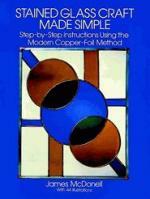 An expert manual that shows how anyone can make beautiful stained glass pieces using the easy-to-learn copper-foil method. Step-by-step instructions and 45 photos, drawings, and diagrams explain every step from making patterns, pattern cutting, scoring glass, foiling, soldering, framing, patinas, and more. 45 black-and-white illustrations. A how-to guide for anyone interested in learning the craft of stained glass. Skills such as glass cutting, breaking, grinding, applying copper foil and soldering are taught in words and diagrams which are easy to understand. Full-size patterns are included for 26 projects; from simple designs for those starting out to more challenging ones for skilled craftspersons.